I’m drawn to performance fabrics because they solve problems for customers. In hot and humid places, mold and mildew can be a real headache indoors, let alone for outdoor use. For the interior fabric industry, many fabrics are labeled as “mildew resistant.” This might not mean that the fabric has been treated with any chemicals, simply that the fiber itself is inherently bacteria-resistant. In fact, compared with natural cellulose or protein fibers, all petroleum-based fibers (polyester, for example) don’t provide environments that encourage mold and mildew to grow. However, just because these fabrics resist mold and mildew, that doesn’t mean they won’t grow in the right conditions. Mold and mildew are fungi, and the stains we associate with them, typically pink, yellow, purple, or black, are byproducts of their digestive process. The compounds they produce can diffuse into a textile and discolor it in a way that can’t be removed simply by washing it. What better way to prevent mildew and stains than to starve them of what they need to survive? 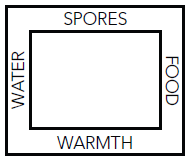 The Mildew Square is a graphical summary of the conditions that encourage mildew to grow, specifically, water, spores, food, and warmth. * Keeping a fabric clean and removing any mold or mildew with diluted bleach (only when recommended for that fabric) will minimize the spores and the food sources that could cause problems. We’ve been using the letter “B” on our tags to indicate that a fabric is bleach cleanable since 2010; we usually test them in our “Brentano lab” before labeling them that way. Choosing designs that allow water to run off of a surface or escape from inside of a cushion will also help prevent mold and mildew from growing. An antibacterial fabric passively discourages the growth of mildew, while a chemical finish is extra protection and is supposed to actively “kill” the germ. An antibacterial finish can be very useful – especially for polyurethane fabrics with high lightfastness performance — but it does not guarantee that there won’t be any bacterial growth if the user doesn’t control the four sides of the Mildew Square. It is also a green issue. Currently, silver ion is considered the most environmentally and health-friendly, especially when you can add it at a molecular level instead of as a topical treatment. The antibacterial finish in our polyurethane is not a topical treatment; the silver ion is added to the polyurethane compound before it is poured so it will not wash off. The effectiveness of antibacterial finishes like these are tested for the most persistent, resilient bacteria, so they’re useful no matter what kind of bacteria or fungus you’re trying to combat. *The Mildew Square is a concept introduced by Dr. James Kimbrough and Dr. Virginia Peart of the University of Florida. Source is Chemical Fabrics & Film Association, Inc.
You are currently reading Mold, Mildew, and Bacteria at Woven-Words.